Daryl Powell felt his Castleford Tigers team should have been bringing the two points home from their trip to Huddersfield Giants. 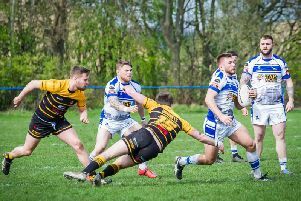 The Tigers head coach bemoaned missed chances late in the game as Cas lost a close game in similar style to their defeat at Leeds Rhinos a couple of weeks earlier. He said: “I thought we should have won it. “There were key moments at the end. Adam Milner has a bit of a pop and we give the ball away there. The set before we have an intercept when we are on their tryline. “But I thought we were great in the second half and were the better team. “A poor defensive read down our left hand side gave them the try that put them in front. It was really disappointing. “We’re in some really tight games at the moment. We are doing it tough. We lost Grant Millington in the first set of the game, which is always going to be difficult for your middle unit. “But I thought we were really good second half. It’s great to have Mike McMeeken back, he was really good and Jake Trueman did some special things. Powell said the team would have learn to lessons from the close games they have been in. He said: “We’re battling, we’re working hard and giving ourselves chances to win games. Powell does not think Milner should get a ban for his actions late on when he took exception to being held down and appeared to aim his head then arm towards Huddersfield's Adam O'Brien. He was punished by being sin-binned and conceded a penalty, which effectively ended Castleford's chances of scoring a last minute try when they were piling pressure on the Giants line. On the possibility of a suspension, Powell added: "I wouldn't have thought so, it wasn't massive. "But I don't think he should have done it. There was no need to do it, he's got the ball so it's clearly not the smartest thing you'll ever see on a rugby field. You've got to learn a lesson from that because these are things that help you win games. "We had two sets there at the end of the game and we come up with an intercept. Actually I think it's a penalty, he'll be offside there coming round the side, but it is what it is. Then we come up with a penalty against us when in possession of the ball. They are not great things to do when you need four points to win the game. "When you've got the ball unless somebody does something pretty bad to you there's no reason to be doing anything other than getting up and playing the ball, your team needs you to do that. It's frustrating obviously."